When I heard a Quad City style pizza place was opening near my old neighborhood in Chicago I knew I had to go. For those unfamiliar, Quad Cities refers to the five cities on the Mississippi River—Rock Island, Moline and East Moline in Illinois, and Davenport and Bettendorf in Iowa. A particular style of pizza is home to that area and it's known for their hand-tossed malt crust pizzas that are scissor cut into strips, not slices. For a city that deeply prides itself on deep dish pizzas, you would think a Quad City style pizza place would not flourish here but from the looks of it, it's been doing pretty well. For those that aren't into pizza, they also have hot dogs, sausages, bratwurst, sandwiches and pasta options on their menu. 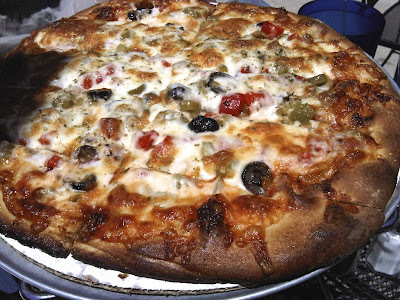 Caroline and I chose for our pizza the garden pizza which came with roasted mushroom, diced green peppers, roasted red peppers, kalamata and green onion mix and Quad Cities Mozzarella Blend. 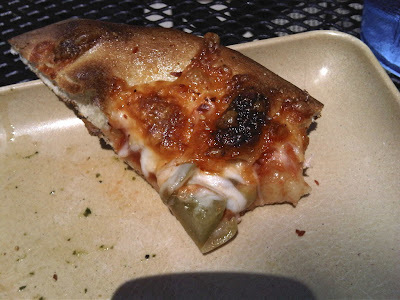 The crust was definitely chewier and a tad on the sweet side. Apparently the darker crust is from the dark-roasted brewer's malt, which is added to the dough. I guess that's what gives it the slightly sweeter crust too. I'm sure there are some die hard quad city style pizza lovers out there but I think I generally prefer the deep dish or thin crust pizzas. We also decided to share a salad so we tried the tomato, avocado & mozzarella salad. 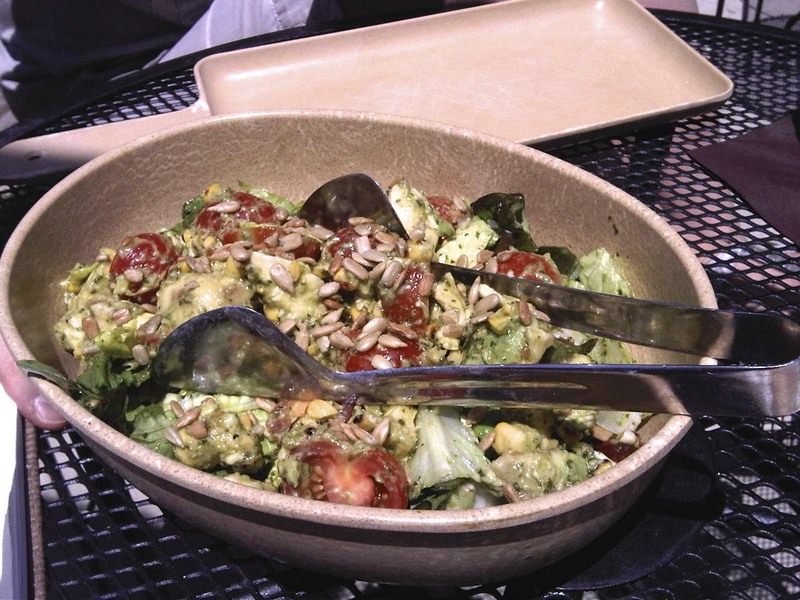 It is served on a bed of chopped romaine and red leaf lettuce with sunflower seeds and roasted corn. This was an unanimous favorite of the meal. I've tried some of their other salads during other subsequent visits and I have to say most of Root's salads are pretty solid. I'm also a big fan of the Proco Joe salad named after their local alderman. It's a great place to sit outside and people watch too so I definitely recommend it on one of Chicago's beautiful summer days.